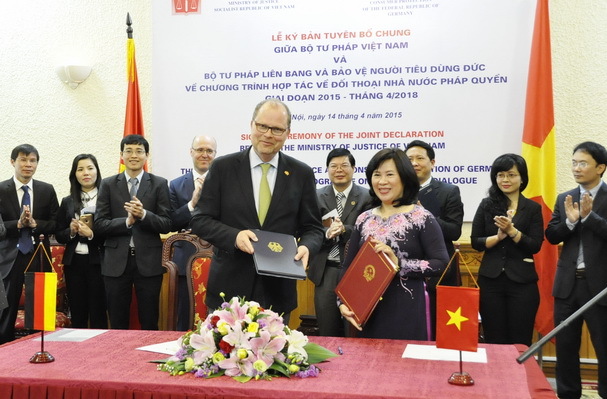 HA NOI (VNS) — Ministry of Justice representatives from Viet Nam and Germany signed a joint statement and a three-year co-operation agreement yesterday in Ha Noi. The documents were part of the Legal Co-operation Programme on Dialogue on the Rule of Law for 2015-2018. Christian Lange, parliamentary state secretary in the German Federal Ministry of Justice and Consumer Protection, was on an official visit to Viet Nam. The joint statement extends a previous agreement on legal and judicial co-operation signed by Viet Nam and Germany in 2008. The Programme on Dialogue on the Rule of Law aims to develop and complete legal frameworks on crime and criminal procedures, civil affairs, civil procedures, economic and commercial affairs, and law enforcement. Other agenda items include building stakeholders' capacities, enhancing society's awareness of laws and expanding the participation of all entities and community members in developing and implementing laws. The approach will include exchanges, training courses, talks, seminars and study tours.